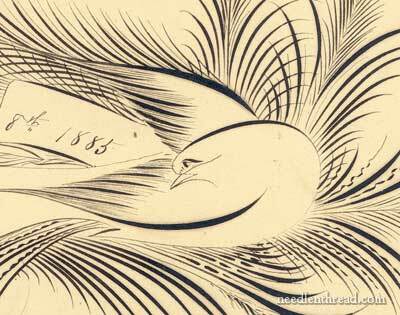 Some of you guessed right away that this silk project is a bird of sorts – and it is! The design is inspired by the swashes and flourishes of ornamental penmanship of the 19th century. This is the type of ornamental, swashy penmanship samples I’m talking about. I chose a much simpler design as my starting point – these flourishy things can get so very ornate! When I first approached the project, I was thinking in terms of black-on-white, or black-on-parchment-colored fabric, to mimic as closely as possible the pen work. But as I worked through the preliminaries, that idea just didn’t grab me. After all, the two mediums are completely different. What may look beautiful done with pen and ink will not necessarily look the same when attempted with needle and thread. Then, I went to the other extreme – I contemplated whitework, with a lot of texture, since this would be practically opposite of the pen work, which is black and completely flat and one dimensional. But that didn’t grab me, either. So I settled on my Greatest Love – silk, with a touch of goldwork. Nothing like working within one’s comfort zone, eh? One thing I have discovered along the way is a nice way to create a slightly textured background with a bit of glimmer to it. I’ll show you that discovery next time we take a peek at this project! A little peek here, a little peek there. At least you know I’m working on something! Tomorrow, needlework tools! I’ll be giving away two nice groups of Bohin needlework-related tools, including needles, scissors, and the like! See you then! Goody, to both this project and the tools giveaway. “Designing Figures, Faces & Florals” by Linda Schneider which has some beautiful and whimsical designs. Looking forward to tomorrow’s post! Thank you for mentioning the book. I will have to take a peek. Did this pattern come from a published book of designs with transfers? I have seen a similar pattern and adore it. I want to buy the book for this one pattern. This might be an intriguing stitch-a-long (hint, hint). I appreciate your sense of adventure by choosing the dynamic blue color. I need to be less afraid of silk. Are you going to be filling in the bird with a solid color? Oops… Missed the last question. No, the bird won’t be filled, but the background around it will be. Thanks for sharing this with us I thought it was either a bird or angel of some sort. Yes like you I love silk and gold together, it looks beautiful. Oh such a shame I’m going away for the w/e will miss your give-a-way on Bohin needlework related tools love their needles hope I can still apply when I return. OH-h-h-h-h, Mary, how lovely. I have used Soie d’Alger, and Carons Soie Cristale and Waterlillies, however, I will try the Soie de Paris on my next project. Is it made by Access Commodities? Mary, this is going to be a beautiful project. I have a “Farmer’s Manual” published in 1895 that has a section on penmanship and I think your birdie is in there. There are several different ones, as well as a horse, a deer, a swan, and the most beautiful lion. I’ve often tried to figure out some use for the drawings and I actually have purchased a couple that were made into cross stitch designs. I’ll be interested to watch yours come to life! What a breath taking shade of blue! It is hard to tell from the picture–is the fabric pure white or a different shade? I really enjoy watching your project progress, Mary. I’ve got the most exciting project coming up! My friend returned from France with an amazing gift-a Bayeux Tapestry Embroidery Kit purchased at Bayeux! I’ve been reading Racaire’s site on the stitch and contemplating backing the provided cotton with more cotton for stability. The provided wool is earthy and textured. As a fairly new embroiderer, this will be a CHALLENGE! Oh gosh! That bird looks so pretty already! Really looking forward to seeing where you go with it. Just been catching up on your site and you have given me loads of inspiration. Can’t wait to see more of this! This is beautiful already. I look forward to watching it develop. I do hope that some day there will be a pattern for that bird you have done. For I would really like to have it framed in my house. 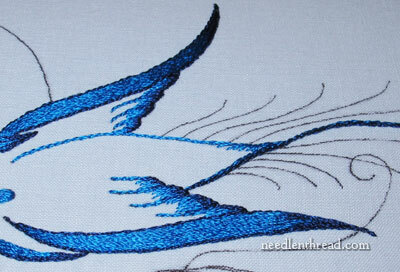 Next Next post: Bohin Needlework Tools for 2 – A Give-Away!